This colored lithograph is promoting the Grand Regatta by the Eastern Rowing Crews that is to take place as part of the Great Bismarck Fair, September 19-20, 1882. There are three scenes on the poster. The image on the upper half is the "Bridge and Dam." It is looking north from downtown at the various industries on the north side of the Kansas River. The names of various companies are visable. The view in the lower left is looking south on Massachusetts Street, the main street in the Lawrence business district. Again, names of various businesses are visible. The image in the lower right shows the "Regatta" with numerous rowing boats on the river as well as a sail boat and other vessels. This is looking north across the river with a crowd of people on the shore, an Atchison, Topeka, and Santa Fe Railraod train, and identified business/industires in the background. 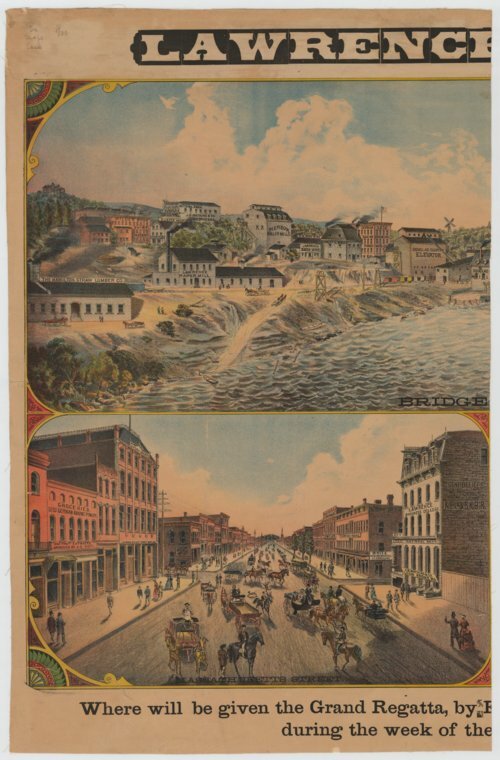 The lithograph was published by Ramsey, Milletta, & Hudson Lithograph, Kansas City (state not given).